From 12:30 to 14:30 on Monday, July 21, meet MSH colleagues working with orphans and vulnerable children (OVC) in Nigeria and Lesoto. 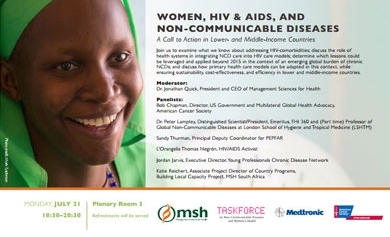 Also on Monday: Join us for a special satellite session on women, HIV & AIDS, and non-communicable diseases (NCDs) at 18:30 in plenary room 3. Join the conversation on Twitter with hashtag #womenHIVNCDs. Co-sponsored by MSH, The American Cancer Society, and Medtronic. Join us to examine and discuss addressing HIV co-morbidities in AIDS and non-AIDS related events; the role of health systems in integrating non-communicable disease (NCD) care into HIV care models; lessons that can be leveraged and applied beyond 2015; and how primary health care models can be adapted in this context of an emerging global burden of chronic NCDs while ensuring sustainability, cost-effectiveness, and efficiency in lower and middle-income countries.